That’s right our wee one is a boy! We had a gender reveal cake at the baby shower my awesome sister threw us yesterday. It has been super difficult keeping that under wraps for the last 20 weeks (we found out 10 weeks in)! But it was worth it to see the surprise on everyone’s faces. I also learned people will in fact buy ALL the things for a new baby. Trust me my hands hurt from cutting off all the tags from some of the cutest clothes, toys, and blankets I have ever seen. It also makes for a whole lot of laundry! Because if I recall correctly from my niece babies go through A LOT of things, sometimes in under an hour! Blowout diaper anyone? Yep those are a thing. So I spent most of last night (with the help of my bestie and hubs) cutting tags off all the things and sort of organizing the nursery. It’s hard when you don’t yet have the baby so you don’t know where the hell you really want everything to go! I’m sure once he’s here I’ll shift things around. Plus we have some shelves that we need to put back up which will also help with organizing the room. But I’ll say this is’t getting super exciting around here as we enter week 34! 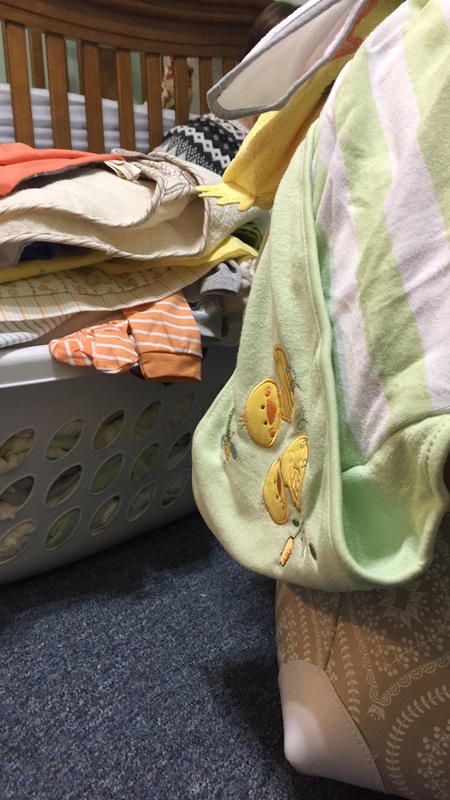 It won’t be long now…until then back to the laundry and the nesting!